I purchased the e-book format of the Winter Princess in September of this year because there was mention of magic and demi goddesses. To be honest, I never read further than those two words so I did not know that this was classified as a reverse harem paranormal. It was not until the opportunity came for me to review the audio book I realised this. Therefore, I was skeptical about reading/listening to this title. Anyway, I moved past my skepticism and hoped I would have no regrets. Now up on completion of the book I had mixed feelings about this story. For, the first half of the book the story moved so slow that I was tempted to give up on it. However, as someone who does not give upon things easily, I stuck it out and was rewarded with a change in the pacing by the second half of the story. Despite the change in the pace, I had a few issues. We see Wyn learning to use her magic and fighting demonic forces. The fight scenes were decent but not memorable. For someone who recently came into her powers she learned to use them quick, which I had a hard time wrapping my head around. Bearing in mind, she had several abilities and in less than a day, she learned how to use them. Then for someone who has no training as a fighter she was a pro on the battlefield. At first, I had a hard time liking Wyn but the more time I spent with her I found myself drawn to her. Wyn is demi-goddess who does not understand the great power she would come to wield when she hit her 22nd birthday. Raised by her human adoptive parents she knew of her magical powers, but what she did not know was that those powers would grow making her a powerful being. She did not have a relationship with her birth mother, the winter queen and she lived for the day when all this would change. Now that she has attained the age of 22 she may get her wish as her mother has sent for to enter the God realm and she would have four gorgeous guardians as escorts. Unfortunately, these guardians did nothing for me. I am still trying to figure out what was their purpose in the story. They never seem to be around whenever their charge is in danger. I never had the opportunity to know the guardians and so I did not know what made them tick. They had no chemistry between them but somehow they were attracted to each other. Their moments of intimacy, which, thankfully were few (they made me cringe) felt forced and unrealistic due to their lack of chemistry. I must admit I am curious to discover why her mother had left Wyn to be raised by humans. There were other intriguing events occurring that have me considering continuing the series as I am curious to know how these would unfold. I had a few issues with the narration. When it came to Wyn’s voice, I thought she did a good job for the most part. However, the switch between Wyn;s voice and those of her guardians was not seamlessly done. There were times when the distinction between Wyn’s voice and that of a guardian was not identifiable. This mostly happens when Wyn speaks immediately after a guardian. Despite this, I found that the narration contributed to me sticking with the story even with the issues I encountered. One sassy demi-goddess. Four hot Guardians. And a few evil people. 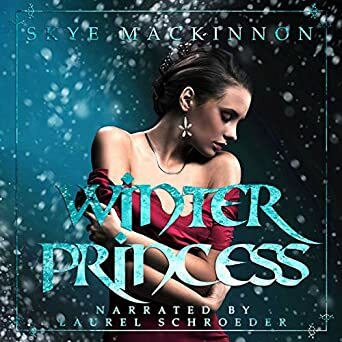 Her mother, the Winter Queen, waits for Wyn in the Realms of Gods, but there are enemies who will try and prevent her from ever reaching the Realms, even if that means going to war. Will Wyn be able to survive the journey? And if she does, can she resist falling for her Guardians?